The subclass Opisthobranchia includes gastropod mollusks that have bilateral symmetry and a tendency toward reduction or loss of the shell. There are ten orders that have been found in Hawaiian waters: Acteonoidea, Cephalaspidea, Runcinida, Thecosomata, Gymnosomata, Anaspidea, Sacoglossa, Umbraculoidea, Pleurobranchomorpha and Nudibranchia. 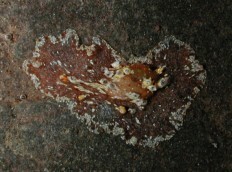 Two orders, the Rhodopemorpha and Acochlidimorpha have often been placed in the Opisthobranchia. However, Bouchet, et. al., 2017 places them, respectively, with the Lower Heterobranchs and marine Pulmonates. Both include small worm-like species that live interstitially in sand or in algal turf. For the number of known species in each group see: table. To display thumbnail images of all the Hawaiian sea slugs on one page for quick identification, click here. To see a page with 40 commonly seen species, click here. To see a page with 40 common species (not the same thing at all), click here. To see a list of recent changes, click here. The order Nudibranchia includes species that lack shells and have various forms of secondary gills. All are carnivores. It is divided into four suborders: Doridacea, Dendronotacea, Arminacea, and Aeolidacea. Hawaiian nudibranchs represent about 57% of the opisthobranch species found in the islands. Several other taxa are often mistaken for opisthobranchs. The following links provide a brief treatment of the most common as an aid to identification. Several families usually listed as prosobranchs and currently placed in the lower Heterobranchia (previously Heterostropha) have been considered part of the Opisthobranchia or closely related to them in the past. The following links provide a brief treatment of some of these families.